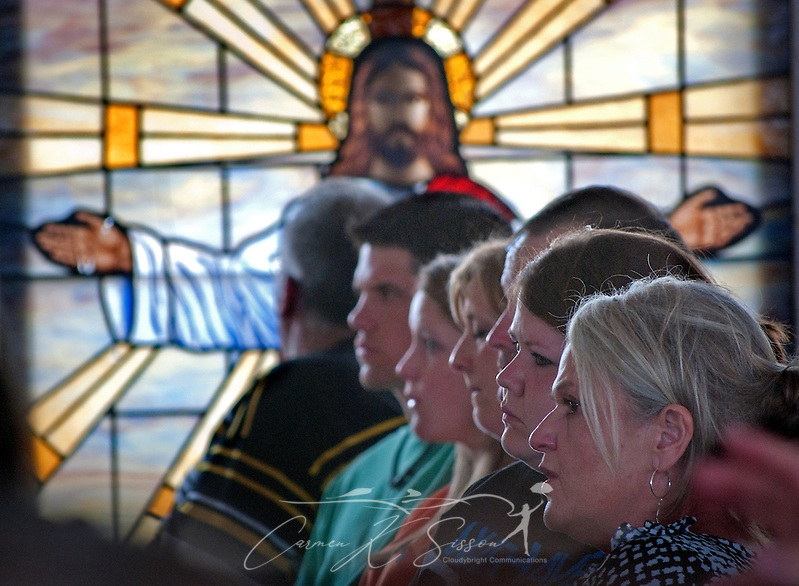 A stained glass window depicting Jesus Christ with outstretched hands watches over members of Smithville Baptist Church during an outdoor worship service May 1, 2011 in Smithville, Miss. The window was one of the few things recovered from the church, which was destroyed — along with most of the town — by an EF5 tornado last week. (Photo by Carmen K. Sisson/Cloudybright) Click here to see complete gallery of Smithville, tornado images. 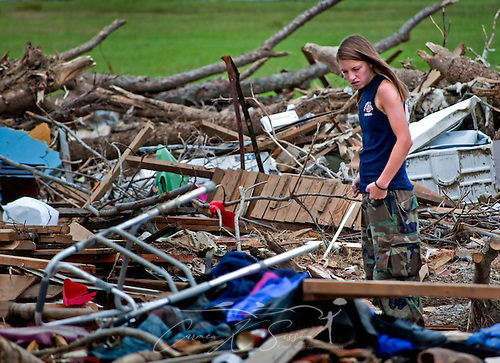 SMITHVILLE, Miss. — The post office is gone. The school is gone. City Hall is gone. Most of the churches are gone. 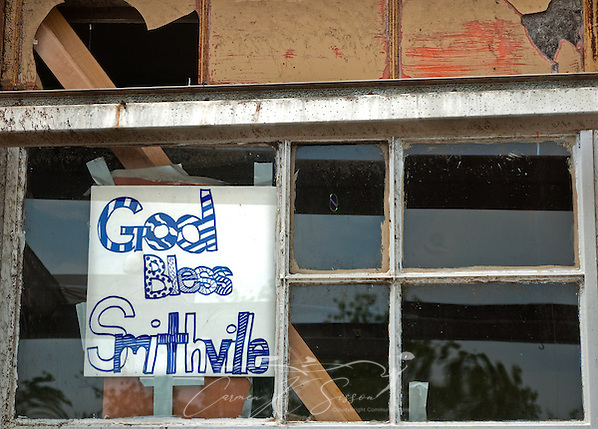 Nearly every building in Smithville, Mississippi is gone — or so heavily damaged they will have to be demolished. The devastation from last week’s F5 tornado is so widespread, so absolute, that it’s easier to tally what remains: The telephone company. Coker’s Han-D-Mart. And an unshakeable sense of faith. Sunday morning, amid the droning of chainsaws, an estimated 500 people gathered beneath a tent in front of the ruins of Smithville Baptist Church, where they laughed, cried, shared stories of survival, and mourned their dead. Even as parishioners praised God and remembered the 16 people who perished in this tiny Mississippi town, search and recovery teams continued combing the fields, looking for the 14 who remain missing. A hearse slipped silently down Highway 25. American flags waved against an overcast sky. At a time when the entire South is hurting, struggling to comprehend a storm system that spawned long-track tornadoes across six states, took 342 lives, and injured thousands, it is a question with no easy answers. Two-story brick homes were swept from their foundations. Buildings that have stood for centuries lie in splintered shards. People of all ages, denominations, and socio-economic levels were affected. For those who are left behind, it makes no sense. And so they draw upon the twined roots of family, community, and faith. In small Southern towns, White said, these roots are so deep, so interconnected, that even when all is gone, church holds the power to act as a cohesive agent, rebinding the shattered, bonding the broken. “A lady asked if this was the end of Smithville,” White says. “I told her, ‘You don’t understand Smithville. We’re not going anywhere. This is our home. And faith is the vehicle in which we travel. 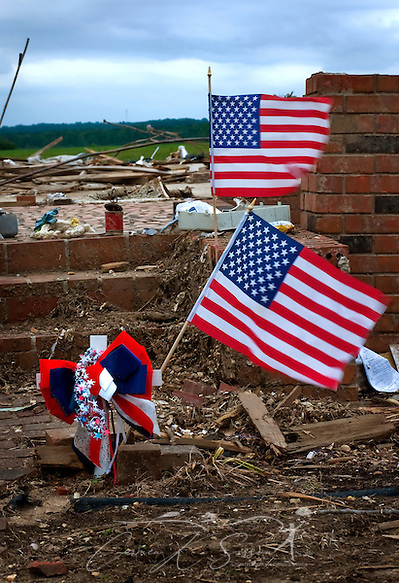 '” White called the tornado a “resurrection moment” for the town, saying he hopes the spirit of the people will serve as a beacon of hope for a devastated region. As youth minister Todd Summerford, 24, picked through the rubble of the church he has attended since childhood, he tried to explain what faith means in a small community like Smithville, where everyone knows everyone, and directions are still given by landmarks, even once the landmarks are gone. Church is the center of Southern rural existence, he says. It’s where babies are baptized, couples are married, beloved residents are laid to rest. It is home. It is life. For Smithville residents like Carol and Jim Herren, their faith is stronger now than ever. Their two daughters were home alone when the tornado struck. The girls took refuge in the hallway, and when the house stopped shaking, they realized the only two walls left standing had sheltered them. The elderly couple in the house next door died. Jim Herren says he has no intention of leaving Smithville. He plans to rebuild in the same spot. Still, it’s hard. “When you walk down the highway in front of your house, and you don’t recognize anything…” His voice trails, and he pulls his oldest daughter to his chest. “God put his hand over the part of the house they were in,” he says. White cautioned residents against pondering the “what ifs.” Earlier in the day of the catastrophe, before the twister hit, he and Summerford had debated canceling regular Wednesday night services. Severe weather was a possibility, but at the time they decided to cancel, Monroe County hadn’t been placed under a tornado warning. In the end, they decided the risk was high enough to warrant telling everyone to stay home. Even as he preaches of resurrection, and the reunion with those who have passed on, he mourns. His people mourn. The South mourns. “I may not know what to do, but I know where to go,” White told the crowd. He pointed out a stained glass window bearing an image of Jesus with outstretched arms. It survived the tornado. So, too, the people of Smithville will survive. 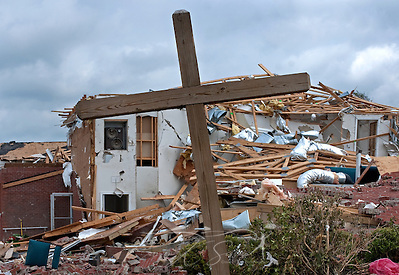 April 27, faith, Mississippi, religion, Smithville, South, TIME, tornado, tornado outbreak. Bookmark.